After our hot walk up the hill to the muskeg plateau, I was ready for a rest while David went off to explore some of the small town of Petersburg. He was intrigued by a building that we could see from the ship, one that had a viking ship beside it. David has been fascinated by the stories of the Vikings ever since his exploration of the Viking Islands a few years ago. The story of that trip is written up with photos on our other travel website www.dymusings.com. A quick look at the town map shows that it is developed on a grid system of roads. It would be difficult to get lost! This is it. The only roads are within the town area. There are no roads from here to any other part of Alaska. The only way in or out is by water or by air. 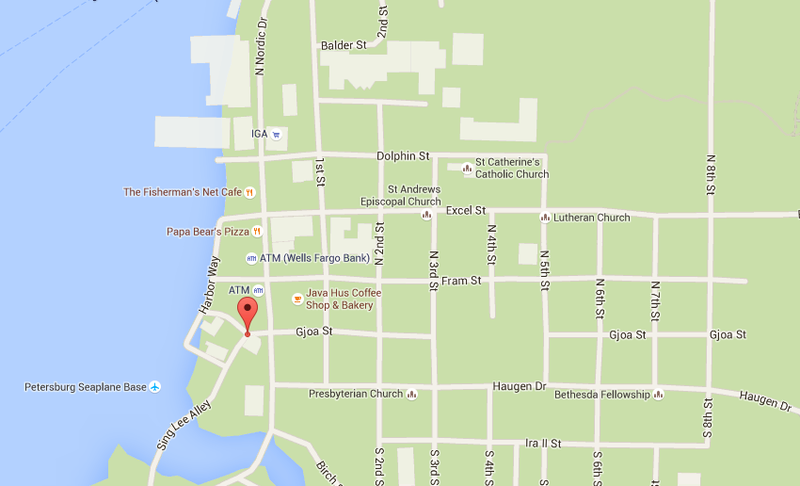 The red marker was David’s first goal; the Memorial Park and Hall but he would explore further. As we looked at the streets on the map we noted at least five different types of church for a town of this size; Catholic, Episcopal, Lutheran, Presbyterian and Bethesda Fellowship. They were not actually on his list to find; he was looking for a book shop. We had seen a very good book on plants of Alaska and, as usual, we should have bought it when we saw it! Located along Sing Lee Alley, the Sons of Norway Lodge building dates back to 1912 when 60 charter members borrowed money and sold $5.00 shares to enable them to construct the hall. 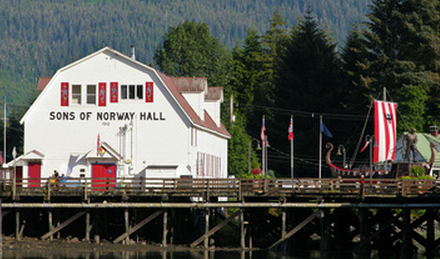 Their aim was, and still is, to share and promote the town’s proud Norwegian heritage. In 1984 the hall was placed on the USA’s National Register of Historic Places. The hall has been at the centre of the community. It has been witness to many wedding receptions, parties, dances, potluck dinners and coffee get togethers. Built on pilings over Hammer Slough, The Bojer Wikan Fishermen’s Memorial Park stands in front of the hall and was built in 2000 in memory of the many fishermen from this small town who have lost their lives at sea. It was here that David found the viking ship, the Valhalla. It was built in 1976 in New Jersey to celebrate the Bi-Centenary of the USA. After appearing in many parades across the USA, including a Tall Ship Parade in new York, it was bought by the Petersburg Little Norway Festival Committee. The Lodge is now responsible for the boat’s maintenance; it stands proudly in front of their hall. Bojer Wikan, a long-time fisherman who promoted the idea of the memorial park, is remembered by this impressive bronze statue. He represents all fishermen. Many memorial name plaques have been placed on the column beneath the Bojer Wikan statue and many more on the low wall that surrounds the park. Reading those plaques is a salient reminder of dangers that face the fishermen, especially in days past when ships were less seaworthy and help in the form of radios and rescue helicopters were not available. After visiting the memorial, David’s walk took him on into the town. There are reminders everywhere that this is a fishing village. Gardens aren’t a great feature of this town, at least in the part David walked through. But there were occasional plants giving some bright colour like this Creeping Buttercup; Ranunculus repens. This plant is not native to Alaska and, as in so many parts of the world, it has become a weed, finding a root hold in disturbed soil along road sides in settled areas. Apart from seabirds, we hadn’t seen many land birds; but every town has crows! Petersburg is not filled with souveneir shops; there are few tourists here. David was still in search of the local bookshop. He not only found the bookshop, but it had a small garden with a group of rose bushes in flower; the Nootka Rose, Rosa nutkana. This native rose grows from northern California into Alaska. It’s named after Nootka Sound, Vancouver Island, where it was first described. The Nootka Rose is undoubtedly a very good rose to grow here. The attractive five petaled pink blooms have a subtle sweet perfume. They appear from May through July. The round, red rose hips, stay on the plant throughout the winter, giving colour throughout most of the year. The plant is hardy, grows in both full sun and partial shade, can tolerate flooding and drought and grows well in many different soil types. And, here in Alaska, it’s pest free. What more could you want? The Petersburg Fisheries museum is housed in a rather attractive building. Unfortunately, time did not permit a look inside. Petersburg has two 35 foot high red cedar totem poles. They were carved in 2000 by Tlingit master carver Tommy Joseph and are placed in a small park directly across the street from the Municipal Building and Buschmann Park. They bring all sections of this community together, the original peoples and the “newcomers”. The tide was coming further in as David made his way back to the ship. Reflections of these old buildings in the slough were quite picturesque. On the way, he was able to sample a yellow variety of Rubus spectabilis. 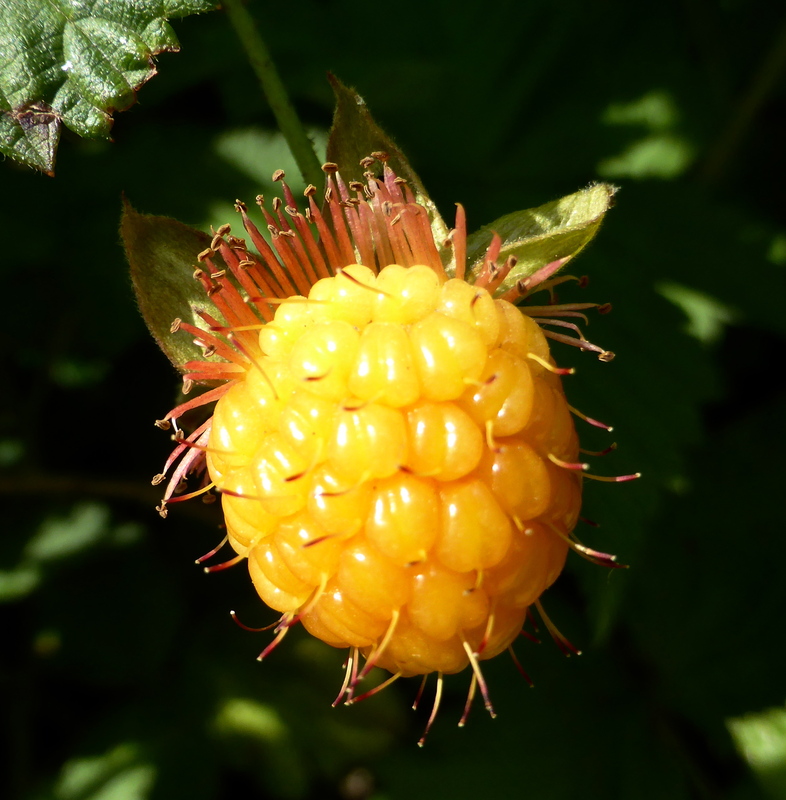 Salmonberry comes in both reds and yellows; equally tasty. Even the old bridges need to be kept in good order here. They are the only means of getting from one part of the town to another. Here, by the roadside, David found another introduced plant, Hieracium aurantiacum, known in Alaska and western USA as the Devil’s Paintbrush. It was probably introduced to these areas as a garden plant by immigrants from Europe who would have known it as Orange Hawkweed. It’s one of Europe’s native Asters. Lovely as it is, it’s an extremely invasive plant, a weed, if we take the usual definition of a weed as ‘a plant out of place’. Orange hawkweed is not just a problem in Alaska and the USA. It’s on the ‘Alert List for Environmental Weeds’, in Australia; a list of 28 “nonnative plants that threaten biodiversity and cause other environmental damage”, especially in alpine areas and the temperate tablelands in eastern Australia. The problem is that it quickly fills spaces that are necessary for the regeneration and survival of native species. It squeezes out the native plants. evidence that this place is home to fishermen. “Sea Lion” awaited his return; and so did I. Like you, David’s photos were my window on the town of Petersburg. While we’d been out exploring during the day, crew members had been doing maintenance; a never ending task especially when the ship is in port. All crew members have to multi-task! When everyone had returned to the ship, we farewelled Petersburg and set sail back out of the channel towards another wilderness destination. Near the head of the channel, this small home was bathed in late evening light. Very soon, we were turning north into Frederick Sound and sailing off into the twilight after another very special day in Alaska. But there was another treat to come! Down in the dining room, a feast of freshly caught Dungeness Crab with grilled corn awaited us. It was indeed delicious.